So, Q had a magnetic screw bowl hanging around and not doing much. I cleaned it up and just had to show you it! It is amazingly handy! I have a normal sewing machine, not computerised in the slightest... so it is handy for my machine feet when going from 1/4" seam foot to zipper foot to the normal foot all in one project. It has magnetised my pins, my scissors and seam ripper. 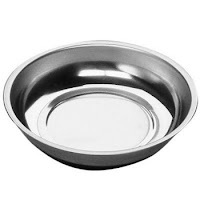 I just did a quick Google search and the bowls can be bought for €5... bargain! So... now when I am using sewing, I can quickly whack my pins back in my pincushion, knowing that they will stay just there and NOT on my carpet. Carpets in a sewing room are a nightmare... let it be said. But hey, we rent and that is just the way it is. All my bits are in place. Housework in the morning... sewing afternoon. Let the 'Bombshell Sessions' begin! At least you can devise a fiendish and streamlined plan in the mean time! What have you bought? Great idea! I have carpet in my room at home and it's horrible! Pins everywhere!! Fan bloody tastic . . .